This article was written for the Hamilton Astronomical Society monthly bulletin, April 2011. The Square Kilometre Array (SKA) is a proposed radio telescope project that has significant implications for astronomers around the world. It also has special significance for us in New Zealand because there’s a good chance our country will be an important partner in the project. The SKA will consist of over 3,000 separate radio antennas, all linked together to effectively form a single radio telescope. 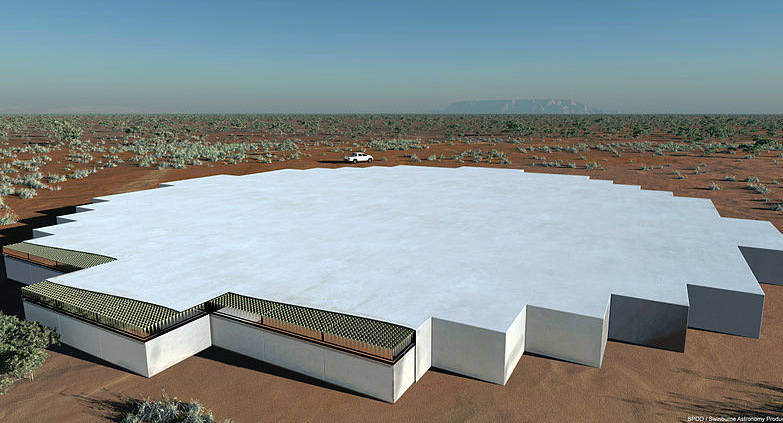 The total collection surface from all antennas will be approximately 1 km2, hence the name “Square Kilometre Array”. However the geographical size of the telescope is much larger. 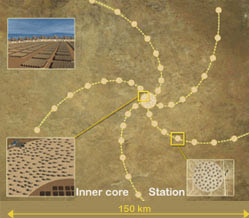 The main “core” group of antennas will be 5 km wide, with smaller groups extending out in a spiral pattern over a vast area. The farthest antennas will be over 3,000 km from the core, giving an exceptionally wide baseline and field of view. The SKA project is run by an international consortium with representatives from more than 15 countries. The project office is located in Manchester, UK. The project was proposed more than 10 years ago and is now reaching the final design stages. New Zealand is a relative latecomer to the project, having joined with Australia a few years ago to present a joint bid to construct the telescope. If our bid is successful, the core and most antennas will be located in Western Australia. New Zealand will likely become home to a small number of antennas. There are currently two construction bids being considered — the other being in Southern Africa (spread across several countries). The African bid may have the advantage of lower construction cost but the Australasian bid appears to have the stronger scientific case. In particular, the Australian location offers the lowest level of unwanted radio noise. It’s too early be confident, but several sources I’ve spoken to say the smart money is on the Australasian bid. 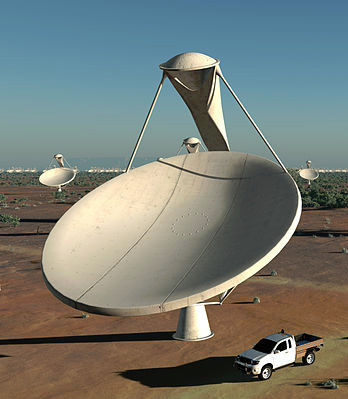 The SKA will be the largest radio telescope ever built, and one of the largest scientific projects ever undertaken. The scale is enormous, as is the budget — around $NZ3.1 billion. The scientific goals are equally lofty. Astronomers plan to map the large-scale structure of the universe and answer questions about the nature of dark energy, gravity waves, the formation of early galaxies, pulsars, cosmic magnetism and more. The data will also be useful in the search for extra terrestrial life — as well as being able to detect carbon in distant solar systems, the telescope will offer the best chance so far of finding artificially-generated radio signals from alien worlds. The SKA will be 50 times more sensitive and 10,000 times faster than any other radio telescope. Phenomenal amounts of data will be involved. Each individual dish will send 420 Gb per second, totalling 16 Tb/sec per aperture array. This will require significant innovation and new technologies in data storage, networking and software development. To put the data flow in perspective, it is estimated that the world currently generates around 1,000,000,000,000,000,000 bytes of new digital information per year. The SKA will equal this in one day. The images on these pages are artist impressions of the proposed arrays in Australia. In the inner core (below), antennas are distributed randomly in a circle 5 km wide. SKA-Low Array: These simple dipole antennas cover the frequency range from 70 - 200 MHz. They will be grouped in stations 100 m wide, each containing about 90 antennas. SKA-Mid Array: These will probably be arrays of 3 m2 tiles covering the mid-frequency range from 200 - 500 MHz. They will be housed in circular stations 60 m in diameter. Dish Array: Covering the frequency range 500 MHz - 10 GHz, these arrays will be the familiar dish design. 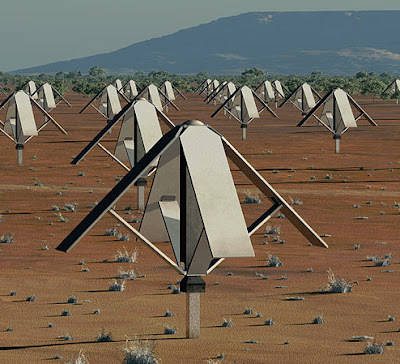 They will probably be similar to the Allen Telescope Array, using an offset Gregorian design. The size will be around 15 m high and 12 m wide. Above: Artist’s impression of the 5km diameter central core of SKA antennas. The successful bid is due to be announced early in 2012. If all goes to plan, detailed design and engineering requirements will be finalised by 2015, construction will begin in 2016 and be complete by 2023. Thanks to its modular design, the telescope can become operational before construction is complete. The first science results should be returned by 2019. The telescope is planned to be complete and fully operational in 2024, and have a life expectancy of between 50 and 100 years. Participating governments will share much of the cost, but an important goal is to secure investment from the private sector. Many new technologies will need to be developed and private enterprise is seen as the best option. In a nice win-win scenario, companies that develop intellectual property for the project will also retain the IP rights, as well as other benefits. What will it mean for New Zealand? There will be many opportunities for local industry. The project will require a large investment and New Zealand is well-placed to deliver. There will also be benefits for the wider community, such as improvements in national network infrastructures. Of course those of us interested in astronomy will be most excited about the potential for scientific discovery, and the fact that New Zealand can contribute to such an important endeavour. One year from now we should know the outcome. Good luck to us!